A platform that does it all! We provide basic registration for issuing event tickets based on criteria. Our solution has been used by leading names in organizers across the world. We just do not simply sell tickets, our integrated social media facilities publicize the event and lead to greater sales. While our competitors focus on provide a selling platform, we provide an integrated selling + marketing platform. How much does it cost? 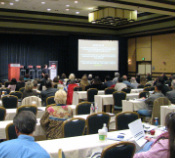 The basic marketing is covered when you list an event with us. We can also provide additional premium level marketing if required on a case to case basis. Check out our event marketing plans.